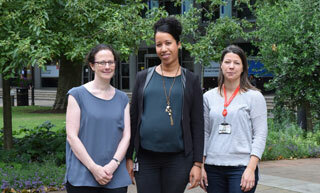 The Centre for Developmental Neurobiology (CDN), the Randall Division of Cell & Molecular Biophysics (Randall Division) and the Centre for Age-Related Diseases (Wolfson CARD), have launched a new Cross-Departmental Postdoctoral Mentoring Programme (PMP) at King’s College London. The aims of the PMP scheme are to provide 1-1 mentoring for Postdoctoral Researchers from the three Centres by pairing them with an Academic, also from the one of the three Departments. The PMP is a response to the identified need for Postdoctoral Researchers to access unbiased guidance in their career path, training and development, as well as items specific to their role. Led by Dr Andreia Carvalho-N’Djai from the CDN, Dr Fiona Wardle from the Randall Division and Prof Elizabeth Bradbury, from the Wolfson Card, and endorsed by the Heads of Departments, Profs Oscar Marín, Mathias Gautel and Pat Doherty, the PMP was based on the experience from the Randall Division’s well established mentoring programme, led by Dr Fiona Wardle, and the IoPPN Mentoring Programme (IMP), led by the IoPPN Research & Innovation Committee (RIC) and Athena SWAN, Diversity and Inclusion Self‐Assessment Team (ASDI SAT), headed by Prof Elizabeth Bradbury. Over 90 Postdoctoral Researchers and Academics have signed-up to the programme and, in a second phase, the programme coordinators plan to expand the pool of mentors to include alumni from the three Centres. We believe the programme will bring added benefits to both mentors and mentees. For example, we hope that mentors will benefit from the personal satisfaction of supporting the self-development of others, building capacity, and encouraging autonomy of the mentees, who will benefit from improved reflection skills, getting support for dealing with specific problems and confidence building in decision making. We know from the Randall scheme that successful mentoring relationships can help postdocs reach their goals and progress their careers. For instance, we have seen one postdoc gain a lectureship position with advice from their mentor. Inspired by the Academy of Medical Sciences mentoring scheme for postdoctoral biomedical researchers, the PMP offers a tailored approach to mentor/mentee pairing, in a process that is led by the mentee. Based on the mentor’s areas of expertise and track record, mentees then select the mentor that is best placed to provide guidance on their career goals and desired skill development area. Both mentees and mentors who had not received formal mentor/mentee training took part in a training session on mentoring facilitated by Sabina Khanom, IoPPN Project Manager (Culture, Diversity and Inclusion) and Gabriela Weglowska, IoPPN Project Officer (Diversity and Inclusion). One main advantage of the PMP is that it is completely managed through a King’s SharePoint website, which was developed by Iain Prout, Collaboration Engineer – Productivity, King's College London, and contains general information about the programme, mentee and mentor profile sign-up forms, mentor nomination forms, and support training materials. Any queries regarding the Cross-Departmental Postdoctoral Mentoring Programme should be directed to Dr Andreia Carvalho-N’Djai (andreia.carvalho@kcl.ac.uk).